Wahl's Motion Lithium Clipper is a German engineered cordless animal clipper that combines the power and durability of lithium ion battery innovation and the cutting performance of the adjustable 5-in-1 blades to give professionals the power they need in one quiet and lightweight clipper. The Motion Lithium is designed for long run times of 90 minutes and operates at full speed until the battery is completely depleted. With a quick full charge time of 45 minutes and the ability to use the clipper as a corded unit while charging, groomers will never encounter lost clipping time. 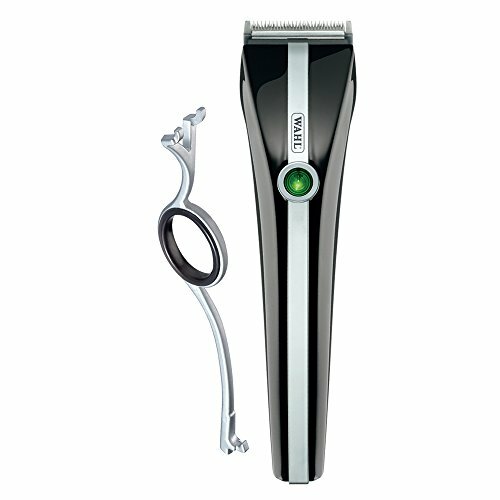 The Motion also has a removable, scissor-like finger grip that helps reduce the risk of dropping and breaking clippers and blades. Why won't my clipper feed through the hair? Chances are that the clipper is functioning properly, however the problem usually is within the blade set. Most often, the blade sets may be dull or have a buildup of dirt and hair. Sometimes all it takes is one hair trapped between the top and bottom blades to affect the cutting performance of the blades. Remove the blade from the clipper and use the cleaning brush provided to remove any accumulated dirt and hair. Oil generously with the Wahl blade oil and reassemble. If the blade is dull or worn, you may elect to have it resharpened at the factory, credible sharpening service, or purchase a new blade at a Wahl dealer. Can my blades be sharpened? Most Wahl blades are designed for maximum life and can be resharpened by Wahl Clipper or a credible independent sharpening service. Check with a Wahl dealer or call 800-PRO-WAHL for information regarding your clipper and blades. Do I need to oil my blades? It is strongly recommended that you keep your blades well lubricated at all times, even during storage between usage. Although Wahl blades are protected from corrosion, they will eventually rust if not taken care of properly. It is suggested that you apply a liberal amount of oil occasionally during use and after the job is finished. Take the time to properly clean the dirt and hair from your blade and apply oil to the entire blade to prevent corrosion. Every Wahl Clipper is packaged with a tube or bottle of Wahl blade oil. It is recommended that you use only Wahl oil on your blades. Other aerosol type lubricants can evaporate leaving the metal susceptible to corrosion. Do I need to buy blade coolant? The majority of our clippers do not require blade coolant sprays, however some of the high performance, high speed professional units may require the use of coolants for the comfort of the animal. If you have any questions about this product by Wahl Professional Animal, contact us by completing and submitting the form below. If you are looking for a specif part number, please include it with your message.